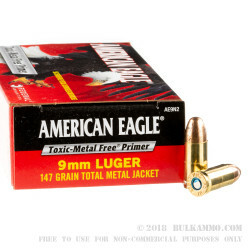 These 9mm Luger rounds from Federal are ideal for indoor range use. 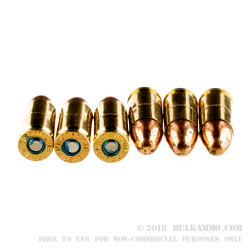 Designed to drastically reduce potential lead exposure, they use non-toxic primers as well as a total metal jacket (TMJ) bullet that covers the base of the bullet, which is left exposed in FMJ ammo. The TMJ bullet will work well in any non-ported firearm barrel. This load fires a heavy 147 grain bullet at 1,000 feet per second. 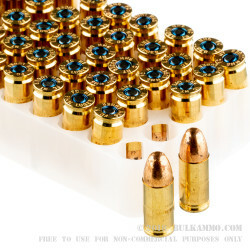 Each round in this box of 50 uses Boxer-primed brass cases. 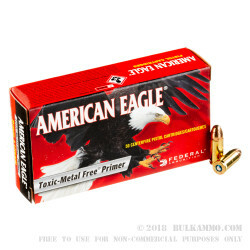 Federal Premium Ammunition of Anoka, Minnesota markets good quality economical range ammunition under the American Eagle brand. The company’s other product lines include HST and Hydra-Shok self-defense rounds, Fusion and Power-Shok hunting cartridges, and surplus ammunition produced at Lake City Army Ammunition Plant to military specifications. The company was founded in 1922 and currently operates as a division of Alliant Techsystems.